Oakland County Fireworks 2019 – Fireworks schedule for Oakland County MI 2019. Fireworks shows info for Oakland County Parks, Festival of the Hills and other Oakland County MI fireworks displays, schedules, info, and events. All research and formatting for this Oakland County Fireworks 2019 page provided by Oakland County Moms. Unauthorized duplication of this content without express consent is a violation of our Terms and Conditions and Data Security policies. Violators will be reported to Google Support for infringement violation of our hard work and research. Fireworks close out FRI and SAT nights at Downtown Rochester’s Annual Winterfest – Fire and Ice. Fire & Ice Festival runs all weekend in Downtown Rochester, Michigan with fireworks shows scheduled after the festival concert (around 8p) on Friday night and Saturday nights. Full schedule of events. Fireworks close out the events for the White Lake Citizens League annual Winter Carnival. Michigan’s 2nd largest fireworks show (disputed w/ Shelby Twp’s fireworks) returns to Borden Park in Rochester Hills. The Festival of the Hills at Borden Park starts at 6p with family games, music and live entertainment. Click here for info. Fireworks Hotline – 248-841-BOOM. The Fireworks in Rochester Hills at Festival of the Hills go on rain or shine. 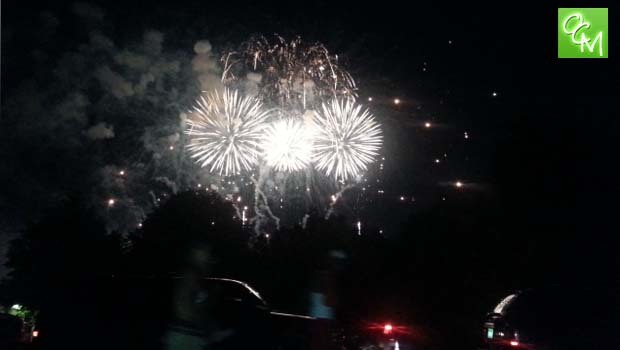 Red Run Golf Course has their annual fireworks display annually on the 4th Thursday in June. This fireworks display is only for members of Red Run Golf Course. Rain Date is June 28. Fireworks are scheduled for dusk at Sibley Park and are annually held on the 4th Thursday of every June. For more info, call 248-624-2850. Annual Independence Day Celebration & Fireworks Display on White Lake. Fireworks will be launched from 2 barges located near the southern end of White Lake. The 2019 Lake Orion Fireworks show will take place on Saturday, June 29. This year the show feature fireworks launched from both East and West sides of Lake Orion. Civic Center Park in Madison Heights hosts fireworks, family fun for kids, live music and more. Fireworks start at 10p. Call 248-589-2294 for details. Join the Wolverine Lake tradition at Tiki Night. The fireworks start after 10p. The fireworks will be shot from a barge in the middle of the lake again this year. There is no parking in residential areas around the fireworks. You can pay Sylvan Lake Community Center parking in advance at City Hall or the day of the fireworks for extra money. For more info, visit www.oaklandcountyboatclub.roundtablelive.org. Rain date is July ?. The Village of Holly will be having their fireworks show at 10p at Lakeside Memorial Park. Rackham Golf Course hosts 4th of July fireworks at 10p. Parking and concessions are available for purchase. Fireworks cap off the Independence Day parade, carnival, and annual 4th of July Clawson tradition. Fireworks start at dusk at Clawson City Park. For complete schedule of events, please visit Clawson4thofJuly.org. Oakland County Parks hosts fireworks at the Oakland County Fair. Entry fees are $12/vehicle or $6/motorcycles and walk-ins. Friday, July 5 is Oakland County Parks and Recreation Day so entry is free for vehicles with a 2019 Oakland County Parks and Recreation vehicle permit. The park opens for day-use visitors at 8a. Entry fees are $12/regular rate and $5/Oakland County resident rate per vehicle. Park entry is free for those vehicles with a 2019 Oakland County Parks and Recreation vehicle permit. Fireworks start at approximately dusk. The park opens for day-use visitors at 8 a.m. Entry fees are $12/regular rate and $5/Oakland County resident rate per vehicle. Park entry is free for those vehicles with a 2019 Oakland County Parks and Recreation vehicle permit. Residents around Maceday Lake and Lotus Lake in Waterford Twp can watch fireworks at dusk! Rain Date is July 7. For more info, Maceday.Lotus@gmail.com. The show begins at 10:10p. Plan to arrive early due to crowd conditions. A special event daily vehicle permit may be required after 5p. A Metroparks vehicle permit is required to enter any Metropark and is only $35 annually for regular admission, $21 annually for seniors or $10 daily. For additional information, please call Kensington Metropark at 810-227-8910 or visit metroparks.com. Fireworks close out Saturday night’s festivities at 2017 Troy Daze Carnival and Festival. If rain, rain date is Sunday, September 16 at 8:30p. For more info, call 248-909-0977. Santa Claus arrival with fireworks! Santa’s official welcome to Oakland Mall for the 2018 Christmas season. After the fireworks, head inside for live music and entertainment. Have your photo taken with him on the lower level of Macy’s. Novi annual holiday festival and tree lighting ceremony will feature fireworks for 2018! Fireworks close the evenings festivities. For more info, visit cityofnovi.org. This Oakland County Fireworks 2019 page is intended to be used as a guide. Oakland County Moms does not endorse these events. Oakland County Moms is not responsible for changes to event descriptions, event times or details being altered without notice or cancellations. More Oakland County Fireworks 2019 shows coming soon as info is released.